Starting the year off fresh, our partner xRaW shows us how to set an invisible landmine trap that can be added to just about any RUST base design. This RUST trap concept can be set up quickly and effectively without the obvious techniques that RUST trap base designs have become known for. In addition, it doesn’t require any advanced electronic systems, while being very simple. If your enemies can walk, jump, or crouch their way to curiosity, they’ll die to the invisible trap base. Play with the concept’s xRaW walks through and add your own spin to them. Find something interesting? Let him know and join his discord to share! With that, you’re here to watch his video, enjoy! Be sure to browse xRaW’s past RUST videos and don’t forget to subscribe to his channel for alerts on his latest work! Hey guys and welcome back to another video. 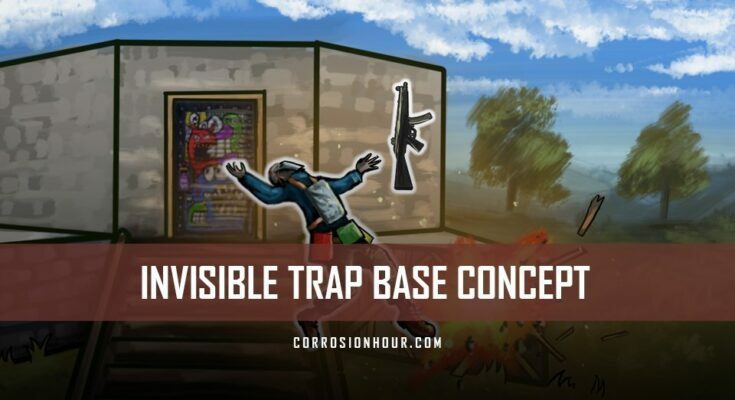 In today’s video we’re going to be looking at a fully automatic trap concept, which uses landmines or snap traps and can be added to any base design. We’re going to be looking at a few different bases to show you how you can build it into any base, whether it’s your main or just for the trap with space for the loot. Coming into the first base here you can see that the place has to crouch to get through. This clips their head slightly through the floor setting any of the traps placed above. You can reset this easily by replacing more on the top. This base also has space to store loot, craft, and has a TC which is protected somewhat, in case you’re raided. I do currently have a 20 pound steam card giveaway in the description just to say thank you for 2500 subscribers so go and check that out. Coming into the next base here, it’s a little bit different. The player has to jump up, clipping their head through the floor as they jump and setting off the trap. You can reset this in the same method as before. Again here, we have space with boxes, your tool cupboard and whatever else you need. I recommend using snap traps in any triangles as you can only place one landmine, but you can place multiple snap traps. The base here is similar to the first, but leaving the front door off and adding a cheesy sign makes the base appear raided. As a player walks through, their head clips through the floor and sets off the trap. You can easily reset this in the same method as before. We also have room for your tool cupboard, furnaces, some boxes, as well as a sleeping bag. This base here is probably my favorite, as it gives the appearance that you forgot to upgrade the bottom and the player can go deep. But yet again, as they walk through it, it sets off the trap. This base is fully functional with plenty of boxes, furnaces, bags and your tool cupboard. And again, you can simply reset this trap by simply replacing the traps in this room and replacing the twig. Coming back into this base here, as I mentioned earlier, you can see that I can only place one landmine and therefor for triangles I recommend you use snap traps as you can fit more in a smaller area. Now the base that I’ve built here is something that I’d usually build, however I added the square floor halfway through the airlock allowing for use of the traps here. This shows how you can easily add it to any airlock. So to build it, we need to build a normal airlock with a half wall which allows you to place the trap. Once you’ve got this in place you can continue to build the rest of your base like normal. In this example, I’m going to build a 2 x 2 of the back. Now once you’ve done this, you can place your traps as normal. Make sure the external, that you do not place a door as players will be able to see the traps on top. You’ll need to place a half wall or build an airlock off to the side or leave this as it is. Be sure to jump in my discord and share with me what you’ve managed to do with this concept. The link is in the description. As always if you enjoyed, be sure to hit the like button as it really helps out. Don’t forget to hit subscribe to catch all of my content.